This is my second review for the brand new A Muse Studio Catalog, if you missed my first one you can check it out here. The brand new A Muse Studio catalog is filled with fantastic new stamps, paper and embellishments!! The are many general themes like the beach and ocean, travel, birthday, sports, phrases and words, large background patterns, alphas and numbers and florals along with trendy cool sets like a fox, hipster gear, donuts, zodiac stars, coffee and loads more. Many of the new stamp sets also have coordinating thin metal die sets to make it easy to cut and layer images. Along with stamps you find party supplies like bags, twine and straws; pattern cardstocks, washi tape, rhinestones, sequins and matching cardstocks, inks, ink sprays, buttons, ribbons and glitter in 5 colors palettes so the color of each matches perfectly. New to this catalog too are patterned Snap Cards, stickers and die cut pieces in 6 themes, these make quick and easy scrapbooking pages and greeting cards. For my first project (shown above) I wanted to step away from making a card and make some jewelry. Stamps make great additions to things like jewelry, scrapbook pages, journaling books, mixed media paintings and lots more, don’t limit yourself to cards. For my Queen Bee Charm Necklace I used stamps from the new Bee Happy set, on a punched Melon Yellow cardstock circle I stamped the honey comb background in black, adding some shading with a yellow marker. On white cardstock I stamped the bee, colored it’s body with the same marker and then added a touch of shimmer to the wings and cut it out. I adhered the background and bee inside a jewelry bezel and filled it with resin. 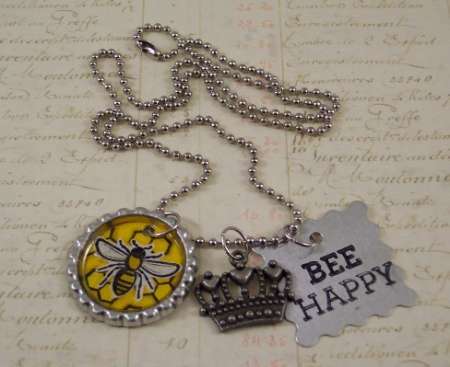 On a metal tag I stamped the “Bee Happy” words using permanent ink. Adding a crown charm, I strung all my charms onto a chain. 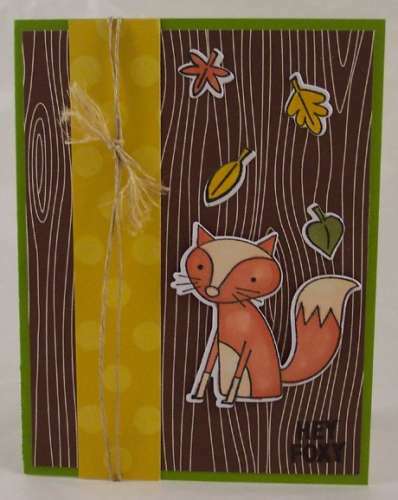 For my next card I used the adorable new Hey Foxy stamp set. I stamped the fox and leaves onto white cardstock, coloring them with alcohol markers and then used the coordinating die cut set to cut out each piece. I love how these dies make a clean and quick cut around the stamped images. I layered my stamped images on a piece of French Roast Woodgrain Cardstock, adding a strip of yellow polka dot paper from one of the Dog Snap Cards , tying Twine around, all on a Grass Green cardstock base. 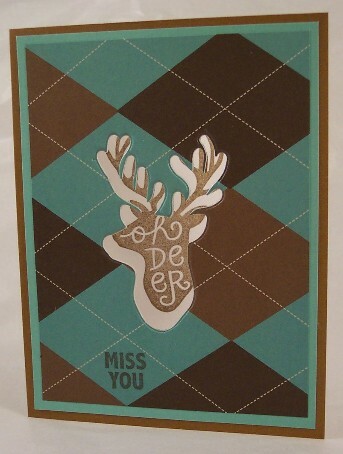 Once again using a coordinating die cut set I die cut the Word Art deer die shape through layers of plaid paper from a Dog Snap Card, Mermaid cardstock on a Cocoa card base. I then stamped the deer stamp *inside* the card so it shows through all the die cut layers. I added the” Miss You” words on the front from the Hey Foxy set. I love how A Muse cardstock is white on the back side, it’s perfect for stamping on the inside of cards, no need to add an extra layer to stamp on if your base is dark. For my last card I incorporated three ocean themed sets to make my cute sea monster card. Is he waving hello or about to grab the ship? 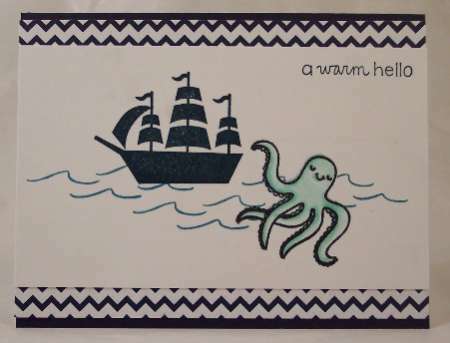 The ship is from the Anchors Aweigh set, the waves are from Life’s a Breeze and the octopus is from the new Sealed with a Fish set. I stamped everything on white and layered with Navy Chevron cardstock onto a Navy card base. I hope you’ve enjoy my peek at some of the fabulous new products from A Muse Studio, I had a blast working with them!! You can view the entire A Muse Studio catalog on line here and place an order with your local A Muse consultant, if you don’t already have a consultant you can search for one here.